Peer assisted learning (PAL) is increasingly popular in undergraduate medical education with a sound evidence base to support its efficacy in teaching and learning. Most medical schools have some form of peer led learning programme and UCL Medical School is no exception. Final year students are invited to undertake a special study component (SSC) in peer teaching in which they deliver a four week long 'introduction to medicine' course to students moving into the 'clinical' years. In addition to teaching itself, this includes the completion of an education based project typically involving resource development, research or curriculum evaluation. 'Things I wish I'd known when starting as a clinical student'. 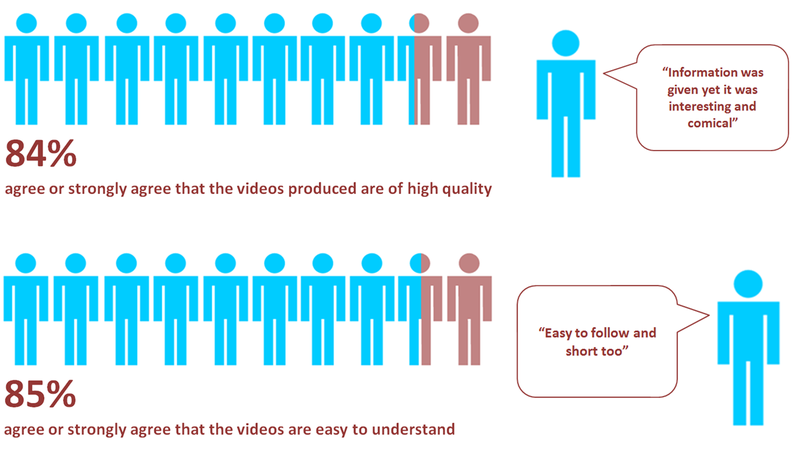 Video content was scripted by students overseen by a member of academic staff. Videos were then filmed and produced in conjunction with the university audiovisual department to create high quality films. Once created videos were uploaded onto the university virtual learning environment for the use of students before starting their first clinical placements. After six weeks, 36 students were surveyed using an online questionnaire exploring their views of the utility of the videos in relation to their new experiences in a clinical environment. Questionnaires consisted of Likert scale responses and free text answers. The use of senior medical students to create peer led educational videos for students starting their first clinical placements has been an overwhelming success. Junior students valued the videos made and in particular felt that the insight brought by medical student resource creators was important. Based on this pilot, UCL Medical School has been encouraged to commission further similar videos and to consider student involvement in all aspects of resource design in the undergraduate medical education curriculum. The engagement of a university audiovisual department is also key in ensuring resources are high quality and accessible after production. Medical schools should be encouraged to involve students in all aspects of peer-led education and in particular in educational resource design where they can offer additional insight into student learning needs. We would like to thank Chris Knapp, audiovisual technician at UCL Medical School for his invaluable time and help in filming and producing the final videos.